Israeli Prime Minister Ariel Sharon is to ask his cabinet on Sunday to approve a prisoner exchange with Hezbollah guerrillas based in south Lebanon. Israel might hand over 400 Lebanese and Palestinian prisoners in exchange for an Israeli businessman and the bodies of three soldiers, reports say. 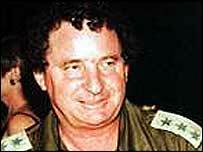 Businessman Elhanan Tannenbaum, who is also a reserve colonel, was kidnapped by Hezbollah in 2000. Germany has been trying to arrange a prisoner swap for several months. Israeli media say information on the fate of missing airman Ron Arad - shot down over Lebanon in 1986 - is also expected to be included in the deal. Last week the Hezbollah leader, Sheikh Hassan Nasrallah, accused Israel of stalling on a prisoner exchange. Israel is holding about 20 Lebanese detainees, including Shia Muslim leaders Abdel Karim Obeid and Mustafa Dirani, who is reported to have been directly involved in Arad's capture.